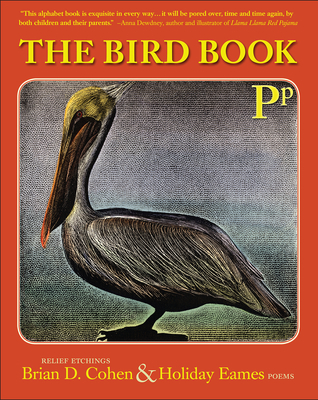 The Bird Book is a children's alphabet book by artist and educator, Brian D. Cohen, with rhyming couplets written by Holiday Eames. Created for their son, David, each letter of the alphabet in both uppercase and lowercase, corresponds to the bird illustrated on each page. The description can be read aloud to especially inquisitive children, or be enjoyed by an adult reader alike. Originally hand-colored and printed letterpress, only 26 copies were made. Now gathered in book form for the first time, printed in four colors on beautiful recycled paper, these stunning prints will also appeal to adults interested in art books, small press books, printmaking, and birds. Their children and grandchildren will thank the parents and gift givers as well, for the birds in the book, and the accompanying couplets will open up a world of art and poetry that will become a family favorite. Holiday Eames studied poetry at Bennington College with Stephen Sandy, and has continued to write throughout her adult life. She is currently a psychological counselor for children.Brian D. Cohen is a printmaker and founder of Bridge Press, publisher of limited edition artist's books, broadsides, and etchings. Brian's books and etchings are held by major private and public collections throughout the country. He is a natural science illustrator and has taught art for thirty years. Holiday Eames, author, studied poetry at Bennington College with Stephen Sandy, and has continued to write throughout her adult life. She is currently a psychological counselor for children.